In this instance, the speakers were the smaller Tidal Contriva Diacera SE's. 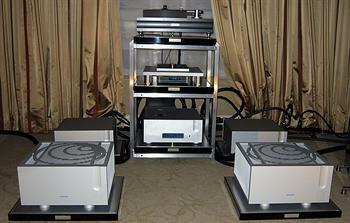 Electronics were provided by Ypsilon, most notably their new, lower priced hybrid amps which use tubes for both the input stage ( Siemens C3g) and rectification (EZ81). This amplifier is a game changing product for Ypsilon and may well put them on a much bigger map. For a little more than a third of the price of the large Ypsilon monoblocks, they deliver 220 watts at 8 ohms, 60 of which is class A, and sonically eclipse the larger amps in every way. These amps are so good that they have resulted in a major redesign of the larger hybrids as well as the flagship all-tube monoblocks heard at last year's CES. Focus, imaging and depth were excellent. The top-end was extended but at the same time delicate and extremely sweet. Note that the very best sound was achieved playing records on the Bergmann Sindre turntable through the Ypsilon phonostage with the preamp set on passive mode.